I received the Zenus Neo Classic case from Gearzap in wine red. The black/grey version had sold out so I took a chance with the wine red. The photos make it look more red than it is, since it does have shades of brown too. In fact the finish is stunning. Above is the front view and below the rear of the case when closed. Opening the case up reveals 3 flaps on the right and the base for the Z tablet to slide into too from the top downwards. 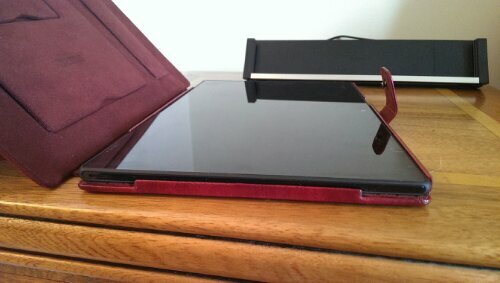 Due to the profile of the Z tablet it is able to slide into the Zenus case as it it was on rails. See below. The case is beautifully designed with the camera hole perfectly cut on the rear, and a space cutoff for the infra red blaster and microphone. The usb flap is not accessible when the case is closed, nor is the case dockable with the official Sony dock. But with the case folded back you have clear access to the usb flap. Also, it is a simple affair to glide the Z out of the case and into the dock. The case has 3 flaps inside, held back with using magnets. One provides a carry strap, which is pointless, and then the other two are for typing mode or viewing position. You have the option of clicking the fastener to the case or leaving it loose as shown above. The stand out impression of this case is one of quality. It does add to the weight and overall bulk, but it will protect you Z Tablet in style. The tablet weighs 495g and the case 322g. One omission is not having a magnet to turn on or off the screen. That’s a shame as its otherwise its a great case . Then again at £45 it should be of top quality.